(NaturalNews) It is safe to say that the link between soda consumption and health conditions like diabetes and weight gain has been clearly established by a plethora of scientific research published in recent years. 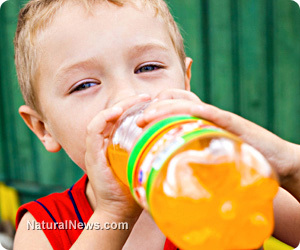 But what has not necessarily been fully recognized or understood is how consuming soft drinks affects the behavioral normalcy of children, particularly young children -- that is, until now. A new study set to appear in the Journal of Pediatrics has found, perhaps not surprisingly, that soft drinks like soda pop and processed juice can make children hyper, irritable and unable to focus, especially compared to their non-soda-drinking peers. Sugar-filled beverages, it turns out, can also make children aggressive, violent and even suicidal, altering brain chemistry and disrupting normal physiological balance. To come to these conclusions, Shakira Suglia, Sc.D., and her colleagues from Columbia University, the University of Vermont and the Harvard School of Public Health assessed roughly 3,000 five-year-old children enrolled in the Fragile Families and Child Wellbeing Study. The participating children came from 20 large U.S. cities, and their mothers reported information on their soft drink consumption patterns and behavioral profiles. Upon analysis, it was found that a shocking 43 percent of children consumed at least one serving of soda or other soft drink per day, and four percent consumed four or more servings daily. But the really disturbing part is that, with each increase in soda consumption among all the children, aggression issues, withdrawal, attention disorders and other conditions became more pronounced. In essence, after accounting for various outside influencing factors like socioeconomic status, parental stability (or lack thereof) and living situations, the study team verified that soda consumption is a direct cause of behavioral problems in young children. In fact, children who drank four or more soft drinks per day were found to be twice as likely as their peers to get in fights, destroy other people's property and physically attack others. "We found that the child's aggressive behavior score increased with every increase in soft drinks servings per day," says Dr. Suglia about the findings. Earlier studies have found that older children, teenagers and even adults are behaviorally affected by soft drink consumption as well. A 2011 study published in the journal Injury Prevention, for instance, found that teenagers who drink at least five cans of soda per week, less than one per day, are more likely to have violent, aggressive tendencies. Similarly, individuals of all ages were found in another study by the same authors to be more prone to mood-related behavioral problems, including feelings of belligerence, depression and suicide. All across the board, drinking soda and other sugar-dense beverages is a surefire way to mess up your brain and mental health, based on this collective research. "Soft drinks are highly processed products containing carbonated water, high-fructose corn syrup, aspartame, sodium benzoate, phosphoric or citric acid, and often caffeine, any of which might affect behavior," say the authors of the Journal of Pediatrics study.